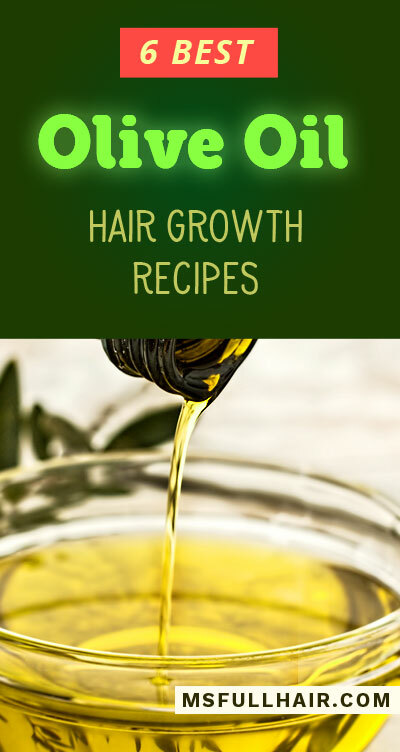 How to Use Olive Oil for Hair Growth - 6 Best Regrowth Recipes Found! Can something as simple as olive oil stimulate serious hair growth and put a stop to hair loss? We found an amazing scientific study on how oleuropein, a compound found in olive oil, can actually promote hair regrowth. The best part? It only took 28 days to see visible before and after results using olive oil – that’s less than a month! In this review article, you will learn every detail about how olive oil can help with hair growth. 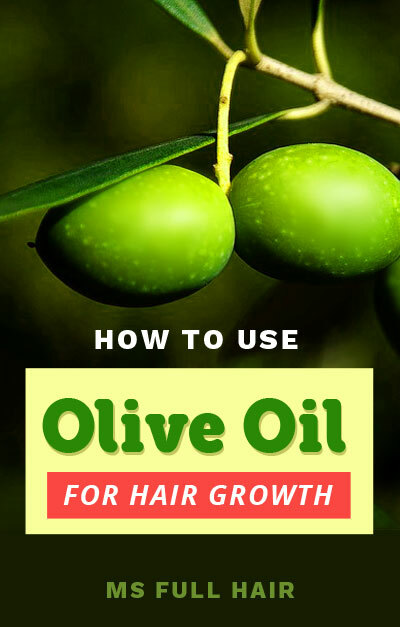 We will first go over olive oil benefits for general health as well as hair and skin, scientific research on using olive oil for hair loss, the 3 best olive oils to buy for hair, and the 6 best olive oil recipes for stimulating hair growth and stopping hair falling out. Olive oil is nothing new when it comes to everyday cooking, in addition to its various uses as natural remedies for curing certain illnesses and health symptoms including hair loss. Olive trees have been around for thousands of years and are mainly found in the Mediterranean. Olive oil is obtained from pressed olives. Spain is known to be the biggest producer of olive oil, but thanks to its increased consumption in United States over the years, California is also making a name for itself by producing one of the best olive oils such as this brand. So what contributes to the popularity of olive oil? Known as the healthiest fat available on earth, olive oil is very rich in antioxidants and Vitamin E. These essential properties protect your body from free radical molecules and prevent damage of cells and tissues. Olive oil is also rich in Vitamin K, another essential fat-soluble nutrient for keeping your heart and bone healthy and regulating blood clotting in the body. There are literally hundreds of uses of olive oil, with culinary applications being one of the most well known. 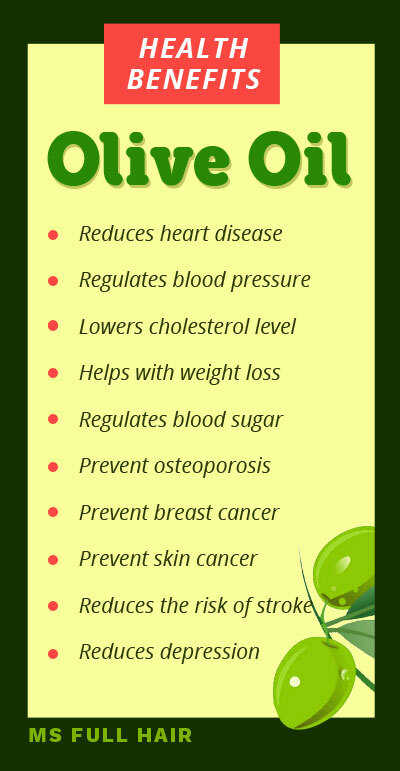 For instance, numerous studies suggest the power of olive oil as a natural remedy for improving various health conditions (such as heart disease prevention, cholesterol regulation – the full health benefits are listed below). Now, let’s get to the most important part – Research studies on how olive oil for hair loss works. Can olive oil prevent hair loss and possibly put a full stop to gradual hair thinning? A 2015 study by Korean researchers gives a solid green light. 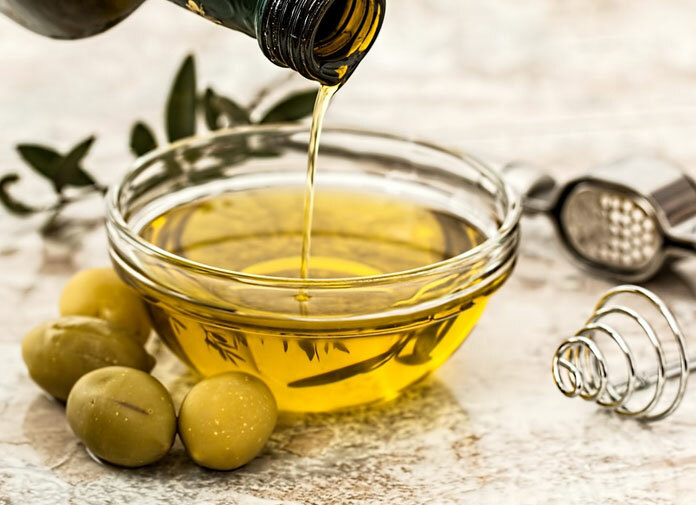 In order to test out the efficacy of olive oil for hair growth stimulating agent, the researchers performed scientific experiments using different methods (mice and follicle cell culture analysis). Reagent was made of 50% ethanol, 30% water and 20% propylene glycol, and group #1 was served as a control group in this experiment. The study lasted 28 days, which is a little less than a month. Even though the duration was rather short, the before and after results showed significant differences among these 3 groups. Also, in order to ensure the accuracy of the study, the samples were measured every week and photos were taken of each mouse during the time. No improvement in group #1: As you see above, all of the mice in group #1 (the control group that was topically applied with 200 ul of reagent), you can clearly see bare skin at the end of 28 days. This means that this group had NO improvement when it comes to regrowing hair. The above pictures show that both groups showed regrowth of hair follicles. 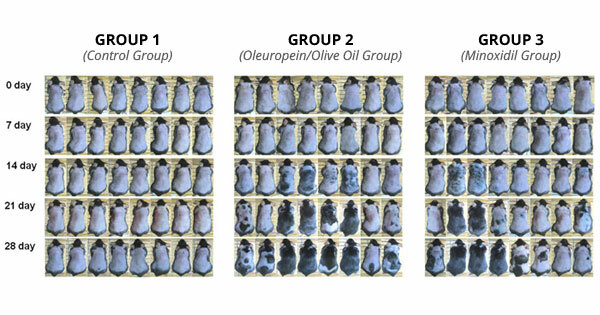 If you look at it closely, group #2 (Oleuropein-treated group) has more number of mice with fully grown hair on their backs. 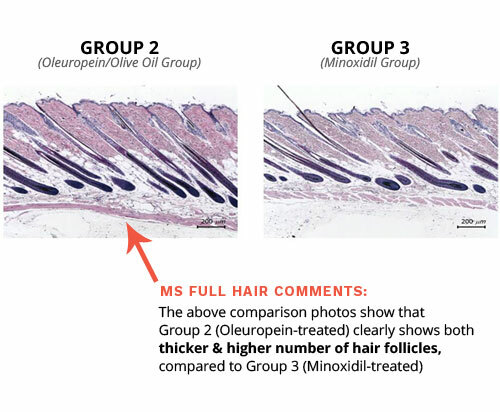 Summary: The mice group #2, which was treated with oleuropein, had the BEST hair regrowth results (Yes – better than the minoxidil group). Were there any side effects during the research? 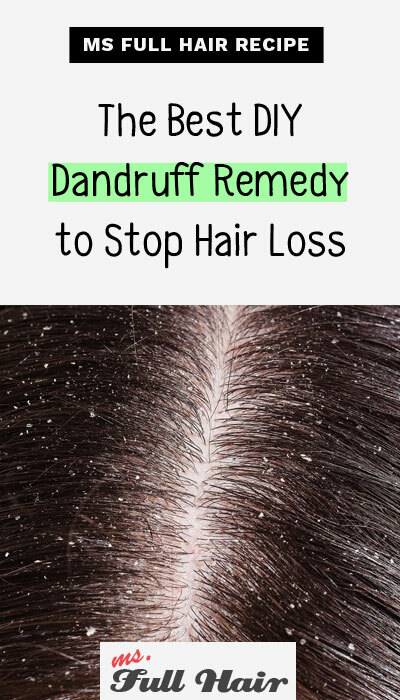 The scientists didn’t find any adverse side effects in any of the groups (which includes the control group, olive oil group, and minoxidil group). 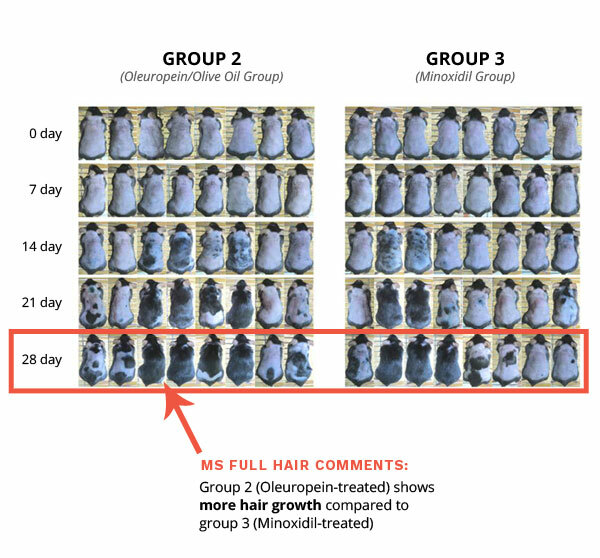 So, the mice experience proved the oleuropein found in olive oil can stimulate new hair growth, but what triggered the hair regrowth in mice? The scientists conclude that oleuropein increases the likelihood of hair follicles to transition from the telogen phase to the anagen phase, thus elongating the active hair growth duration. Hair growth cycle is made of 3 stages – Anagen, Catagen, and Telogen. 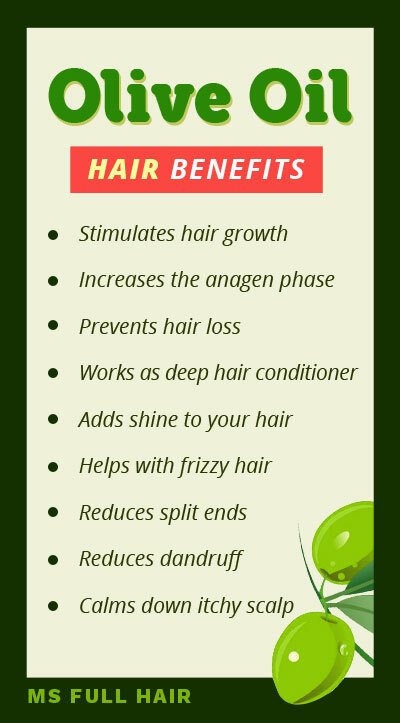 Anagen: Anagen is known as the growth phase, meaning hair follicles are actively growing during this stage. This phase continues for 2 to 7 years depending on each individual. If you are having a difficult time growing your hair beyond a certain length, it’s likely that you have a shorter Anagen phase. In reverse, women who can grow their hair very long without thinning on top have a longer anagen phase. Catagen: Also known as the transitional phase, hair follicles in this stage detach themselves from the derma papilla, where nutrition for follicles comes from. There are about 3% of hairs in this stage at any given moment and it only lasts about 2 weeks. Telogen: Telogen phase is also known as the resting period. 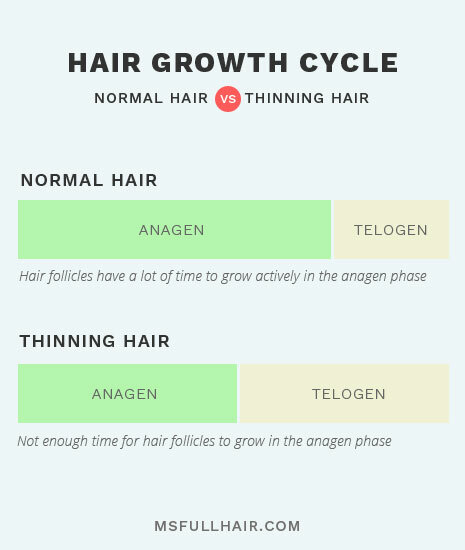 When follicles are in the telogen phase, they are simply sitting there without getting any nutrients. This, in turn, will result in these follicles falling out from the scalp. About 10-15% of hair follicles are in this stage and it usually lasts about 3 months. 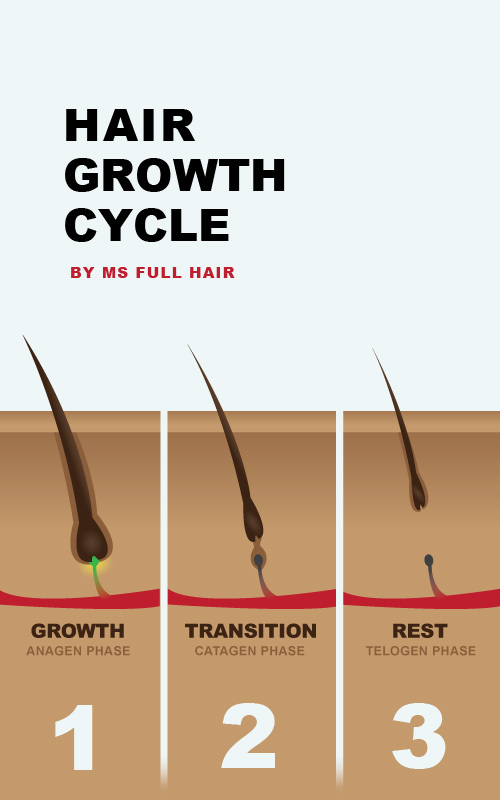 Each follicle goes through this 3-step hair growth cycle, which repeats itself continually. This usually means that thinning hair is often caused by a shorter duration in the anagen phase and a longer duration of the telogen phase. In other words, follicles don’t get to spend enough time in the active hair growth stage. 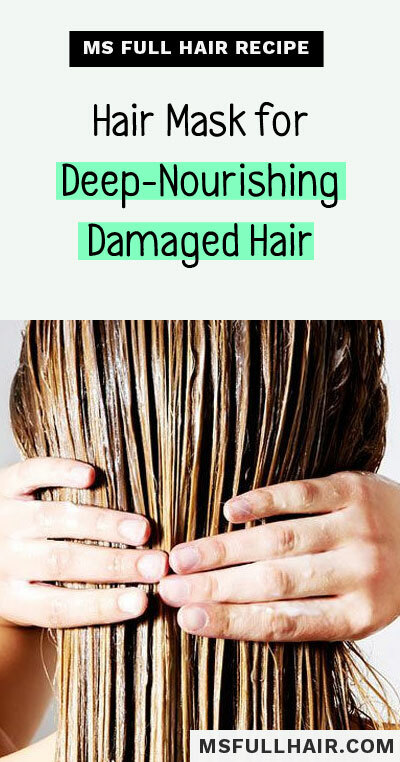 Instead, these follicles spend more time in the telogen phase where no nutrition is available, thus hair fall out occurs. While there hasn’t been any clear evidence on why this abnormal hair growth cycle occurs, one of the possible reasons is linked to Dihydrotestosterone (DHT) – the biggest hair loss enemy. Olive oil helps hair follicles to stay in the anagen phase: The researchers found that oleuropein converts telogen follicles to the anagen phase, so that they can get the proper nutrition from dermal papilla and continuously grow. That’s where olive oil comes in. While this study was limited in mice, the before and after photos clearly proved that oleuropein can work just as effective as minoxidil as a topical treatment (or even better). When the researchers performed a test about the effect of oleuropein on derma papilla cells, the results showed oleuropein’s natural ability of cell proliferation, which was significantly higher than minoxidil. Beta-catenin is a protein involved in cell development. When it comes to hair, the activation of Wnt10b/β-catenin signaling pathway plays an important role for developing and regenerating hair follicles. The researchers found that oleuropein (found in olive oil) significantly increases the level of B-catenin in dermal papilla cells as much as 212%! Another study we found proves the importance of B-catenin when it comes to promoting new hair growth (source). In this study, the researchers observed B-catenin actively being present in the dermal papilla of the anagen stage. But when B-catenin was removed, it led hair follicles to go into the catagen phase prematurely in mice (meaning no more hair growth). Here is another research finding about Wnt10b/B-catenin in relation to age-related hair symptoms (source). The result of this study also points to the same conclusion When Wnt10b is up-regulated, it also increases B-catenin in hair follicles. These two then work together synergistically and stimulate follicles to RE-enter from the telogen to the anagen (hair growth) phase and regrow hair. The researchers point out oleuropein’s ability in regulating the above gene expressions, which are directly related to different aspects of growing healthy hair. This is an interesting one. The above 4 findings are based on applying oleuropein topically, while this one is about dietary consumption. Then, there are a number of studies suggesting a close link between heart disease and premature baldness. These studies gathered data from about 40,000 men with male pattern baldness. About up to 70% of these men who experienced hair loss on the crown area of their heads had increased risk of heart disease. This is where olive oil can come as a natural remedy to alleviate this symptom. One of the main benefits of consuming olive oil is known for reducing the risk of cardiovascular disease and providing anti-inflammatory benefits. The above scientific findings lead to one conclusion: Olive oil can be an effective natural hair loss remedy by inducing hair follicles to stay longer in the anagen phase and stimulating various hair growth factors. When it comes to finding the best (real) olive oil, you need to start your research from knowing the different grades. And within each grade, it can further be divided into types. For this article, we will keep it simple and give you the essence. What makes extra virgin olive oil the TOP quality is the pressing and production methods. In order to be qualified as extra virgin olive oil (EVOO), it starts from non-defective fresh olives. These olives are then pressed without any high-heat or chemical additive processes to ensure its purity and full aroma. Here are olive oil brands to trust according to the National Consumers League. These high-quality extra virgin olive oils are great for both topical use of stimulating hair growth as well as consumption. They are also called the “healthiest” because of the pure cold-pressed extraction method which keeps the active enzymes intact for maximum benefit. 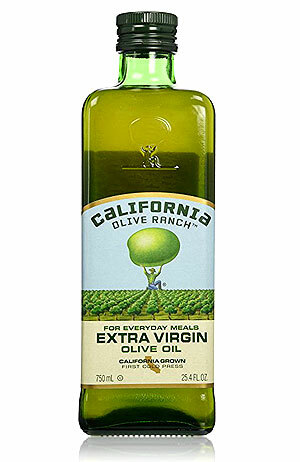 The name says it all – This extra virgin olive oil is 100% locally-grown on California ranches. Featured in numerous magazines and sites including Food & Wine, Forbes, and bon appetite, this superior quality oil is certified by the California Olive Oil Counter (COOC). The committee goes through a rigorous process to ensure its freshness and purity. This oil is also non-GMO verified – another big plus for being 100% natural oil. 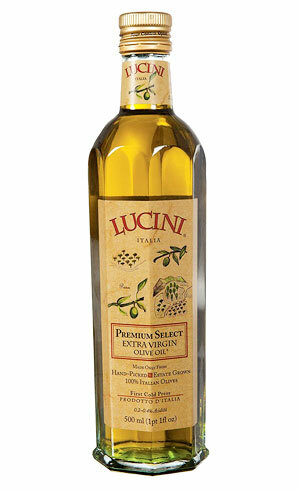 Lucini Premium Select Extra Virgin Olive Oil is made from 100% Italian olives. In order to ensure the quality, farmers first hand-pick olives in the central estates of Italy, where100+ year old trees are grown in an optimal climate to produce the best olives. These hand-picked olives then get cold-pressed WITHIN 24 hours of harvest for maximum freshness. This oil is also free of both gluten and GMO’s. 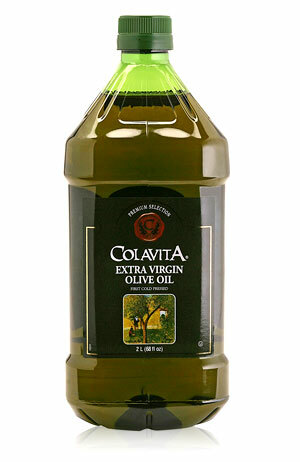 Colavita Extra Virgin Olive Oil happens to be the #1 best seller on Amazon right now. Also imported from Italy, the company uses the same rigorous procedures to produce the best quality extract (no chemical additives, cold-pressed, minimal acidity). Colavita EVOO also has the quality seal from the North American Olive Oil Association (NAOOA), which follows the strict IOC standards, requiring an array of chemical and sensory analysis to test its quality and authenticity. Looking for the best olive oil recipe for hair? Use any of these olive oil treatments. After compiling a handful of olive oil for hair growth reviews, we selected and formulated a number of recipes for the purposes of 1. preventing hair loss; 2. stimulating new hair growth; 3. providing deep moisturization to hair strands. Apply 6 days a week for several weeks to see results. According to a study on Peppermint essential oil, the researchers saw fast hair growth results in as little as 2 weeks in mice. NOTE: Increase or decrease the amount of oil using the suggested 2% ratio. For instance, if you want to make twice more than what’s suggested here, you can use 12 drops of each essential oil (peppermint, rosemary, and lavender) and 12 teaspoons of olive oil. Did you know you can also use olive oil for hair loss and dandruff prevention? Leave it from a couple of hours (the most popular) up to overnight (use a shower cap to sleep in for overnight treatment). Want to make your own ALL natural hair loss shampoo from scratch at home? As you are about to see, making natural shampoo is actually really easy. The bad news? There’s none! 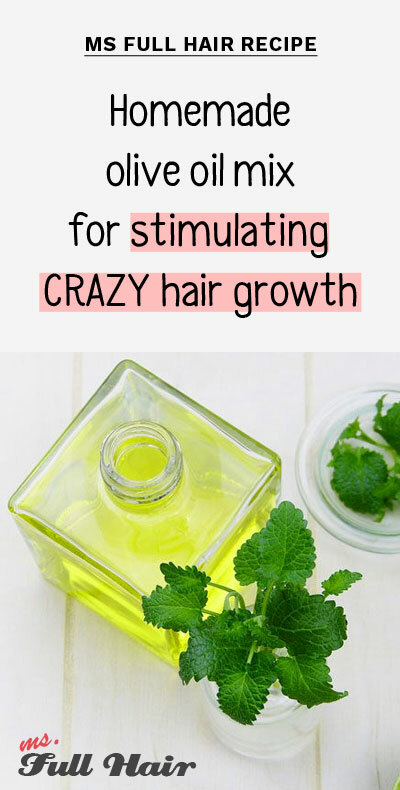 Related Post: How to Use Peppermint Oil for Hair Growth – Visible Results in JUST 2 WEEKS! 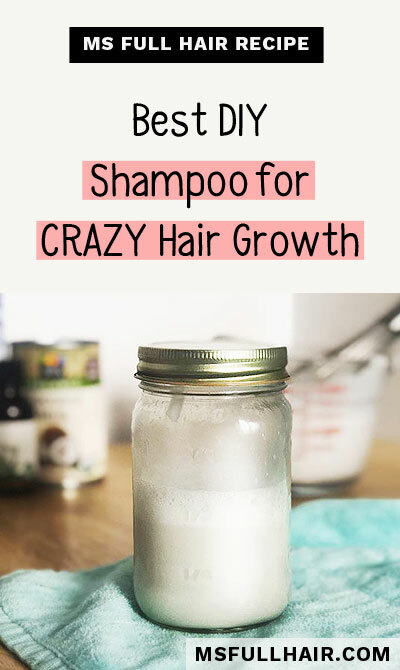 Quick & Easy – Lazy Girl’s Approach to Make Hair Growth Shampoo in Just 3 Minutes! If you want to make your own hair loss shampoo, yet not a big fan of the “everything from scratch” approach, you are not alone. 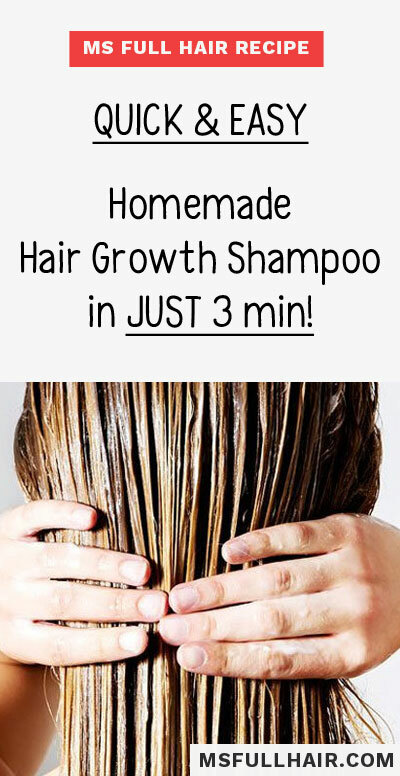 Follow this simple guide to make your shampoo within 3 minutes! Can you sleep with olive oil in your hair overnight? Yes, olive oil is a gentle carrier oil that provides both moisturizing and hair growth stimulating benefits. Cover your head with a shower cap or a plastic wrap to protect your bed. How to apply olive oil for hair growth? Refer to the directions from any of the DIY olive oil hair growth recipes above. In general, you can dab on your fingers and apply directly onto the scalp section by section. Once applied all over the scalp, use a scalp massager tool such as this in order to increase absorption and hair growth stimulating effects. How long should olive oil be left in hair? 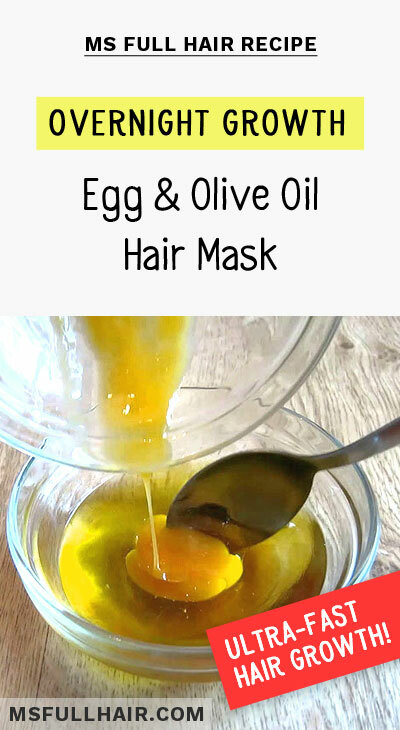 In general, it’s recommended to leave olive oil (or olive oil based hair mask or treatments) for about an hour. There are people who leave olive oil on their hair overnight. If you plan to leave it overnight, we recommend starting with once a week and slowly increase the frequency. Is olive oil good for black hair growth? Yes, not only does olive oil have a natural hair growth stimulating property that works for all types of hair, this carrier is also widely used as a deep conditioner for treating frizzy and curly hair strands and adding a smooth finish. Is there any side effect of olive oil for hair growth? Unless you have an allergic reaction to olive oil, there haven’t been any major side effects reported in using olive oil for hair. A couple of minor side effects includes acne or skin breakouts when used on sensitive skin. When it comes to consumption, over-consuming olive oil can cause diarrhea due to its natural laxative property. Olive oil may not be the ultimate cure for treating all types of hair loss, but studies show promising results of olive oil as powerful hair growth stimulant by inducing the anagen phase for hair follicles. When choosing the best quality (aka “real”) olive oil, make sure you are choosing extra virgin olive oil such as this that is tested from reliable associations that test the purity and ensure they are free of chemicals. Finally, when you are using olive oil for hair growth, don’t forget to add essential oils (see our recipe #1 above) to make it extra powerful to stop hair loss and stimulate regrowing your hair. Have you used olive oil for stimulating hair growth? Share your experience in the comment!